Although Microsoft promised that it will be delivering a syncing app to replace Zune, you are no longer forced to use that. There is Mass Storage mode for both the memory card and the internal phone storage and you can upload files on both. There is no requirement (except for the ringtones) where you put your files (specific folders, etc.). If the phone has the appropriate app to handle a file, you'll have access to it. Since there is no WP file manager, unrecognizable files are only accessible on a computer. The new sync app is called Windows Phone and is available only in Windows 8 and only within the Modern/Metro UI. You can upload pictures, videos and music from there, sync apps and bookrmarks or launch Find My Phone service. We guess Zune should get updated soon to support Windows Phone 8 as well. The OS knows music and video, as well as pictures and documents. But if you have let's say a ZIP or a RAR file, you won't be able to attach it in emails. In addition to your phone + SD storage you also get at least 7GB of SkyDrive cloud space. Windows Phone 8 requires all phones to come with NFC connectivity, but comes with just one app to use it out of the box - Wallet. Unfortunately we won't know if that has any potential to become actually useful for at least few more months. Of course, there's also the Tap&send option, which allows you to send files between devices by simply tapping them together. The transfer is actually made through Bluetooth, but NFC is used to do the initial pairing. Windows Phone 8 has finally added support for Bluetooth file transfer. You can now send documents, pictures, songs and videos through Bluetooth. Just turn the Bluetooth on, go to the app where your file is and tap the share option. Apple, you are out of excuses. 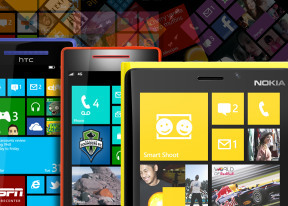 Microsoft equipped Windows Phone 8 with a brand new service called Data Sense. It’s made for those users who use a modest data plan and are aiming to cut on the traffic usage. When you launch the Data Sense app you’ll have to input your data plan specs. Then the service will automatically adjust the data usage of your phone according to your specific plan. The adjustments include web page compression, image resizing, automatic switching off of low priority services that require internet connection, etc. If you near the limits of your plan before the month is over, the data usage reduction measures should become even aggressive. The Data Sense will give you notifications about your data usage and what’s left of it. You also get a live tile, so all that info can be available on your homescreen. The Internet Explorer web browser on Widows Phone 8 brings a major performance upgrade, but sticks to the old looks. Almost everything Microsoft has done on the IE is under the hood, but the end result is pretty good. As usual, the URL bar is always visible at the bottom of the screen and next to it is the refresh button (but the status bar at the top of the screen auto-hides, so you don't actually lose any screen real estate). You can, of course, bring up the extended settings, which offer a great deal of options - tabbed browsing, recent history, favorites, share options, pin to Start, find on page and advanced settings. The URL bar also serves as a search bar. Unfortunately you can use only Bing as search provider, because using the URL bar as a search filed automatically redirects you to the Bing Search app. The browser interface is quite minimalist - you have only the URL bar at the bottom with a reload icon to the left. Swiping the bar upward reveals shortcuts for tabs, recent, favorites, add to favorites, share page, pin to start and settings. The settings menu offers the usual options like location, allow cookies, delete browsing history and you can set a global preference for mobile or desktop site versions. And finally, you can open more than six tabs simultaneously. Eight or ten worked just fine. Just don't expect Flash support. Silverlight doesn't work either. The Windows Phone 8 browser is certainly a capable performer, and uses hardware graphics acceleration to provide smoother graphics and animations. It topped our SunSpider benchmark charts, but scored disappointingly low in BrowserMark. Bing also offers song recognition and a barcode scanner. The new feature here is Local Scout. Thanks to the dedicated app and its provided service, you can search for various points of interest near you. The camera scanner can also snap a photo of text, run OCR and translate it into another language.